Hey, heat wave. I’ll beat you at your own game today. I’ll drink boozy lemonade on the porch and you can just do your thing. As long as I have an ice cold glass of this sour Campari lemonade, I’m fine with you. Enjoy your stay. Last summer, I drank Rosé lemonade by the jug. This summer? I choose Campari lemonade. I love this recipe because you can make absolutely everything from scratch (homemade pucker-y lemonade recipe below), or you can buy it at the store. You can be your own mixologist and make it all yourself, or you can make like a frat guy and dump Campari into a jug of lemonade. Either way, you can’t go wrong. The only reason I like to make my lemonade from scratch is because I like tangy, almost sour lemonade. The final drink tastes like a sweet and sour Campari punch. I’m obsessed. Are you a Negroni lover? Please, come in and stay a while. I love Negronis. I think that you have to be one who likes bitter flavors to love a Negroni. 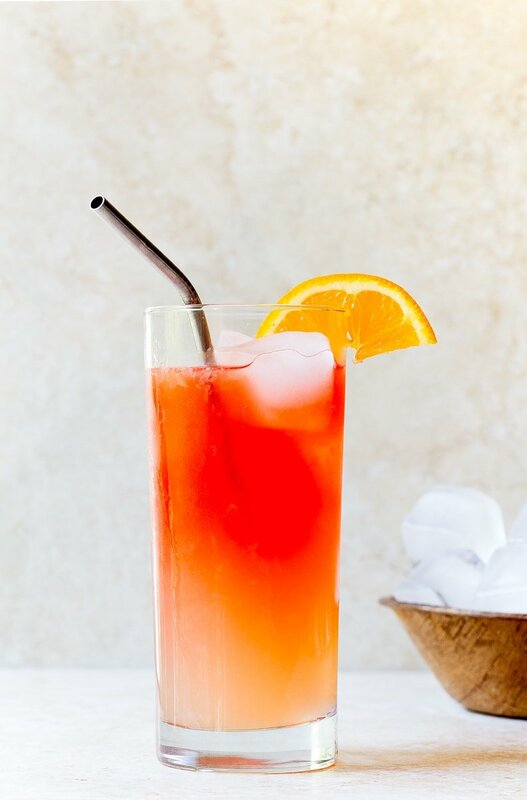 If you have a lingering bottle of Campari or Aperol in the bar with which to make Negronis, dust it off and make a Campari lemonade! I hope you guys are having a great summer, and are staying cool! In a small sauce pan, combine the sugar with 1/2 cup of water. Bring to a simmer and stir until the sugar dissolves, about 1 minute. Let cool. Combine the sugar syrup mixture with the lemon juice. Taste. Add more water if you think it's too sour. Pile ice to the top in two glasses. 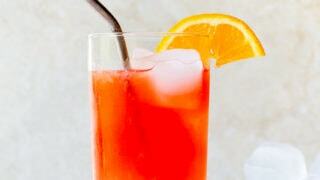 Pour the lemonade over the top, and add a shot of Campari to each glass. Stir and serve. Such a cute photo of Camille!!! Camille You’re killin’ me today, this looks incredible. tasty drink. Wow such a cute photo of Camille. Awww, so cute picture… i am not able to close my window… cuti pie in sun glasses. The drink is perfect for the summer… more than drink… and the cute picture of camilie is incredible.